Are you looking for a unique and healthy side dish? Well, this paleo cauliflower recipe is a prefect option. Cauliflower, like broccoli, is also loved by many. Cauliflower has many health benefits such as vitamin C, vitamin K, folate, pantothenic acid, and vitamin B6. It is a very good source of choline, dietary fiber, omega-3 fatty acids, manganese, phosphorus, and biotin. To try this amazing dish, you can start by cutting the cauliflower into florets then place the florets in a food processor and pulse until they become a rice like texture. Transfer the riced cauliflower to a large microwave-safe mixing bowl and microwave on high for 2 to 3 minutes, until cooked through then remove the bowl from the microwave and set aside to cool for about 5 minutes. Add the melted ghee (or coconut oil), chopped chives, garlic powder, coconut flour, eggs, and salt to the mixing bowl. Mix until all the ingredients are well combined then use your hands to form the mixture into 6 to 8 patties. Set aside. After that, Heat the coconut oil in a skillet over medium heat. NOTE: You want the coconut oil to be deep enough to partially submerge the patties. Fry the patties in the coconut oil until browned, about 2 to 3 minutes per side. Remove the patties from the oil and place on a paper towel lined plate to remove any excess oil. And voila! There you have it your home made crispy cauliflower cake! Serve and enjoy! 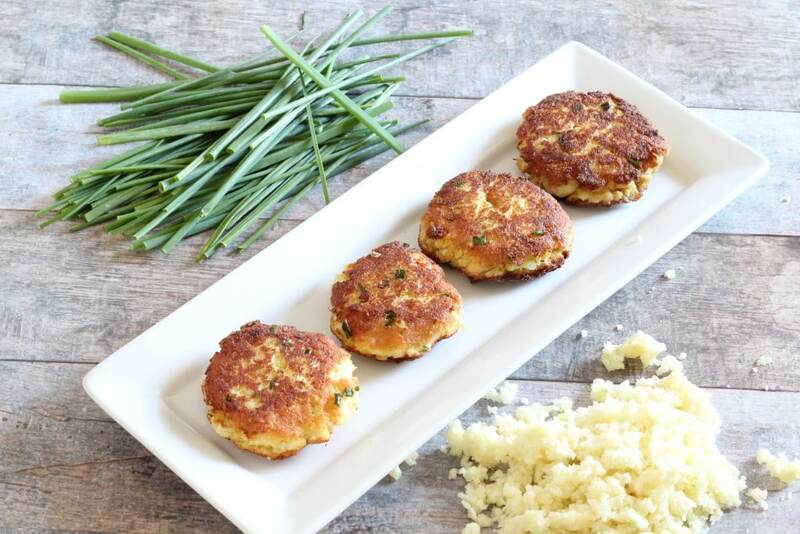 Whether you’re looking for a snack, appetizer or side dish, these crispy cauliflower cakes will wow your taste buds—leaving you wanting more. Riced cauliflower is bound together with eggs and coconut flour, giving you a moist, inner cake with a crunchy, outer layer. 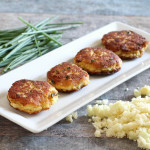 The garlic powder and chopped chives give a delicious and satisfying flavor. Serve by themselves or with sliced avocado and lemon. Cut the cauliflower into florets. Place the florets in a food processor and pulse until they become a rice like texture. Transfer the riced cauliflower to a large microwave-safe mixing bowl and microwave on high for 2 to 3 minutes, until cooked through. Remove the bowl from the microwave and set aside to cool for about 5 minutes. Add the melted ghee (or coconut oil), chopped chives, garlic powder, coconut flour, eggs, and salt to the mixing bowl. Mix until all the ingredients are well combined. Use your hands to form the mixture into 6 to 8 patties. Set aside. Heat the coconut oil in a skillet over medium heat. NOTE: You want the coconut oil to be deep enough to partially submerge the patties. Fry the patties in the coconut oil until browned, about 2 to 3 minutes per side. Remove the patties from the oil and place on a paper towel lined plate to remove any excess oil. We made these on the Foreman Grill to save on the pan frying in so much oil … and they were great. Not as crunchy (obviously) but really tasty. I’m wondering if you could give me an idea of the calorie difference between cooking them in the oil vs on the Forman Grill?